Uvi Poznansky: A Deeply Emotional Journey Of Love And Loss. 5.0 out of 5 starsA Deeply Emotional Journey Of Love And Loss. 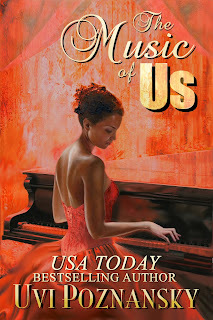 An amazing tale of love, strength and commitment, The Music of Us is an incredibly emotional and moving portrayal of Lenny and Natasha’s journey through life. When successful pianist Natasha begins exhibiting the signs of Early Onset Alzheimer's, Lenny takes us back to the past, when he first met Natasha, detailing the events which kept throwing them together. Their poignant love story is told with heart and humor, an account of two people who are fated to be together, detailing their love and loss, covering the years from the Second World War to Vietnam and into the seventies. Giving the reader an accurate sense of the world as it was back then, the well-chosen details provided by the author will take you back in time, along with Lenny. As the Alzheimer’s starts taking over their lives, Lenny’s dedication to Natasha makes him try anything to bring pieces of her memory back, and the love and commitment he has for both her and their marriage is truly touching. And I can certainly relate to the story since my own grandfather died in his early sixties from complications resulting from Early Onset Alzheimer’s, while my father is currently battling the disease. As with every piece of art created by Uvi, The Music of Us is wrought from the heart, and will take you on hauntingly emotional journey of love and loss.